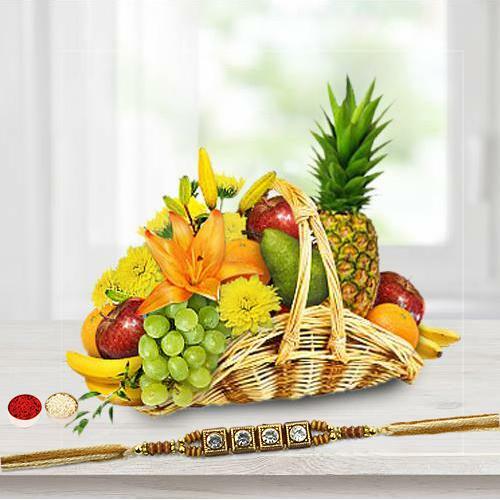 Let your dear ones enjoy the terrific taste of our Fresh Fruits by sending this Fresh Fruit Hamper (5 Kg.) consisting of different types of High Quality Fresh Fruits like Apples, Bananas, Oranges, etc with 1 Regular Rakhi and Roli Tilak Chawal. Let your dear ones enjoy the terrific taste of our Fresh Fruits by sending this Fresh Fruit Hamper (5 Kg.) consisting of different types of High Quality Fresh Fruits like Apples, Bananas, Oranges, etc with 2 Regular Rakhi and Roli Tilak Chawal. Let your dear ones enjoy the terrific taste of our Fresh Fruits by sending this Fresh Fruit Hamper (5 Kg.) consisting of different types of High Quality Fresh Fruits like Apples, Bananas, Oranges, etc with 1 Bhaiya Bhabhi Rakhi and Roli Tilak Chawal. Let your dear ones enjoy the terrific taste of our Fresh Fruits by sending this Fresh Fruit Hamper (5 Kg.) consisting of different types of High Quality Fresh Fruits like Apples, Bananas, Oranges, etc with 1 Family Set Rakhi and Roli Tilak Chawal.